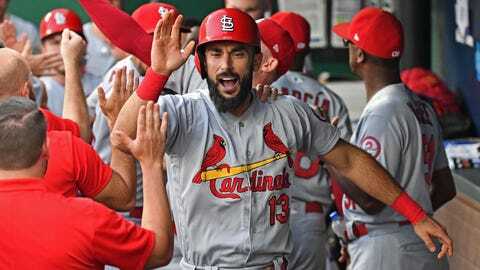 Matt Carpenter homered for the sixth time in seven games as the Cardinals defeated the Royals Friday night. Cardinals: RF Yairo Munoz left in the sixth inning with a sprained right wrist after swinging at a pitch. Adolis Garcia replaced Munoz and singled in the eighth for his first big league hit. … OF Tyler O’Neill (groin inflammation) began a rehab assignment with Triple-A Memphis. … RHP John Brebbia (right forearm tightness) was placed on the disabled list retroactive to Monday. … RHP Adam Wainwright (right elbow inflammation) threw batting practice at the club’s complex in Jupiter, Florida. “All reports of that were favorable,” Cards interim manager Mike Shildt said. “We’ll see how he recovers.” He said the team is evaluating whether Wainwright throws another batting practice or begins a minor league rehab assignment.